Pearl Update: Assistance Requested From GIA! 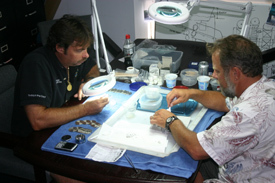 Akira Hyatt, a gemologist from the New York office of the GIA (Gemological Institute of America) has come to Key West to assist Gary Randolph, Jim Sinclair and Duncan Mathewson with the examination of the Margarita Pearl collection and to help us in structuring a plan to take 30 selected pearls to their lab in NY for some non-destructive analysis and testing. 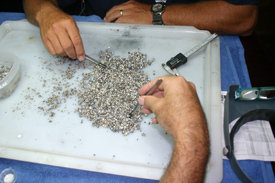 They will then be giving us a report on their condition and any impurities that may have leached into the pearls, possibly from the lead box in which they where found so that we will have a better idea on how to conserve and stabilize them properly. 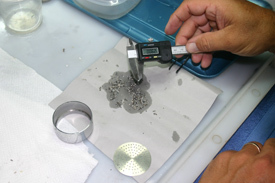 This first batch of 30 pearls will be our test case and once the GIA’s testing and reports are complete, our conservation process can be implemented and evaluated. 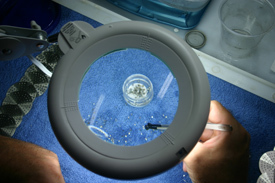 Once the first batch has been put through the conservation procedure, we will check our results and continue to do the rest as long as we haven’t encountered any problems with the conservation processes we decide to use. 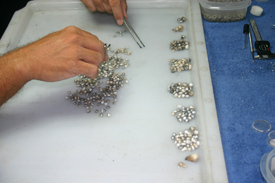 Our sorting and counting of the pearls is continuing and it has becoming apparent that our initial estimates of 2,000 pearls where a bit low. We are currently over that number and have not even started counting the smaller pearls as of today. This will most likely take another week or two to complete the sorting and counting of this extremely rare collection of pearls.